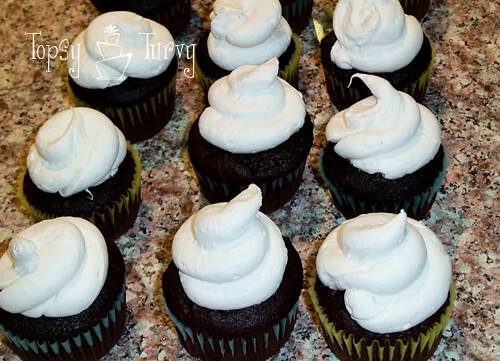 I made mini versions of these cupcakes a few weeks ago, but wasn’t happy with how flat my marshmallow frosting was. My marshmallow frosting TASTES amazing, and is great for frosting cakes, and cupcakes, but it’s thinner- so it can be spread easily- and for this I wanted thick and fluffy. SO I decided to use my regular Marshmallow recipe. And pipe it on while it was still warm and not set. Soak the gelatin in ¼ of a cup of cold water in a small bowl and set aside to swell for 10 minutes. In a large saucepan pour the sugar and second measure of water. 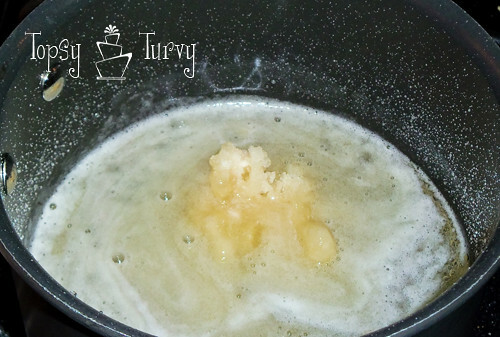 Gently dissolve the sugar over a low heat stirring constantly. Raise the temperature and bring to the boil. Boil steadily but not vigorously for 15 minutes without stirring. Remove from the heat and allow to cool until lukewarm. 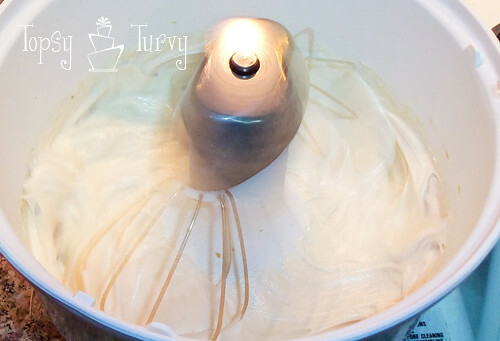 Add the vanilla and whisk the mixture with your whisks in your mixer until very thick and white. This is when you would normally pour it into a pan, but we’re going to scoop the warm marshmallow into a pipping bag. 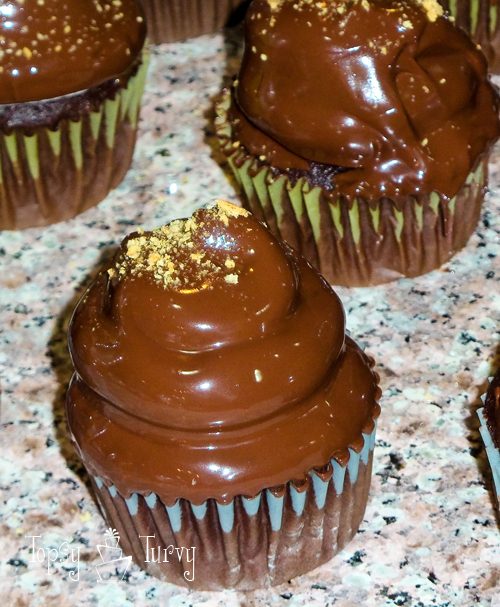 Pipe your cupcakes as fast as you can and set them aside to dry. If you take too long to pipe them the marshmallow inside the bag will thicken and harden and you won’t be able to squeeze any more out! 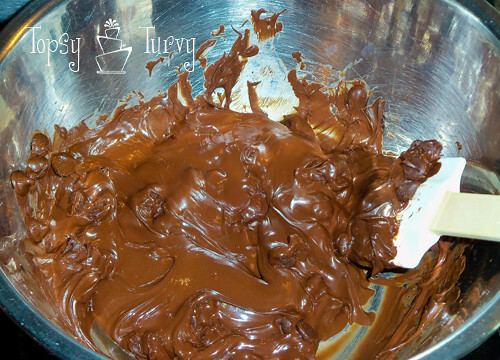 While those are setting up and getting a crust we’re going to melt the chocolate. You can use any chocolate you want, I like using semi sweet chocolate wafers that I melted in my homemade double broiler (metal bowl sitting in a small pan of boiling water). If it’s not smooth enough add some shortening or oil, but not too much. Now that the marshmallow is stiff your going to dip it into the chocolate! 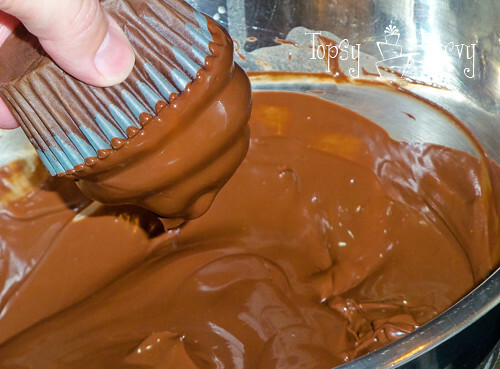 I like to dip it all the way up to the cupcake paper to seal it and keep everything fresh. I dip on one side and spin it around getting the whole thing. Sprinkle crushed Graham crackers (or anything else you like) on top and let the chocolate cool!!! My kids couldn’t wait and broke into the warm cupcakes, getting chocolate everywhere, but it tasted great! And the next day, the few left, were also still amazing!!! Just wish I made a bigger batch! In a large saucepan pour the sugar and second measure of water. 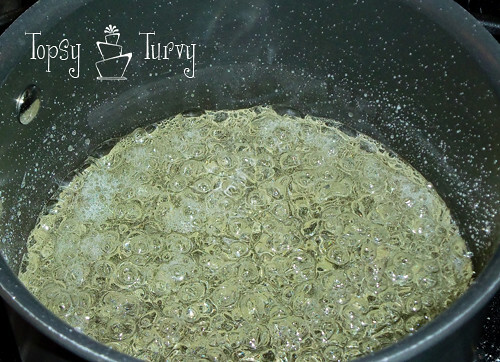 Gently dissolve the sugar over a low heat stirring constantly. Raise the temperature and bring to the boil. Boil steadily but not vigorously for 15 minutes without stirring. Remove from the heat and allow to cool until lukewarm. 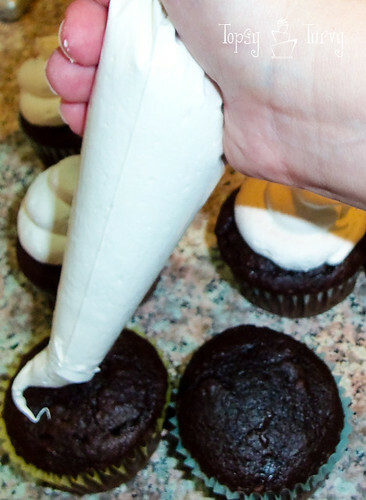 Pipe your cupcakes as fast as you can and set them aside to dry. If you take too long to pipe them the marshmallow inside the bag will thicken and harden and you won't be able to squeeze any more out! Now that the marshmallow is stiff your going to dip it into the chocolate! 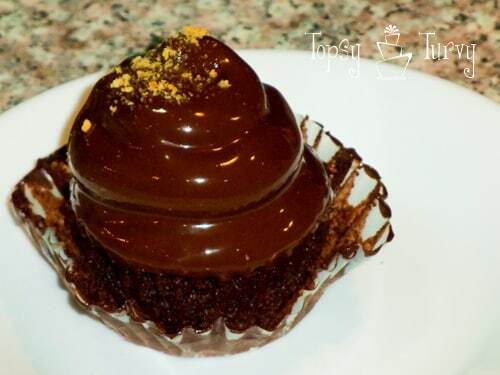 I like to dip it all the way up to the cupcake paper to seal it and keep everything fresh. I dip on one side and spin it around getting the whole thing. Sprinkle crushed Graham crackers (or anything else you like) on top and let the chocolate cool!!! You are making this pregnant lady drool. I’m glad!!! It means I’m doing something right!!! As soon as I saw the heading I knew I would be in love with this recipe! Can’t wait to try it! It is fabulous! And it makes great marshmallows as well! it sure is!!! I’m am so sorry that I didn’t get you a recipe!!! I feel terrible. I really wanted to do it. Oh my heck, Ashlee! I’m having a chocolate moment here that’s not pretty. I’m soooo hungry looking at these–they look amazing! Can.not.wait to try these. I’m not going to lie, it’s wonderful!!! Enjoy! What is the cornstarch and icing sugar mixture for? HA! I copy and pasted the recipe for marshmallows over… Usually you take the marshmallows and pour them in a wet pan. Let them set, cut them up and shake them with the mixture to coat them so they don’t stay sticky! Oh my goodness, they look amazing! I wish I had one right now! Thanks! They did turn out really well! They are a bit messy, since the kids couldn’t wait until they cooled to eat them, but oh so good! Thanks! I hope you try them out sometime! Super fun. Who knew? Not me. It’s a keeper. I mean, what’s a “little” sugar, right? Exactly!!!! Theres always room for a “little” sugar! Thanks! They did turn out really well…. Mmmm Now I wish I had some more! Hi! I host a weekly blog hop — It’s a Keeper Thursdays. I’d love for you to stop by and link up! I love how versatile this idea is. I can see it with lots of flavors of cake and/or white chocolate coating and it would all be So delicious. Thanks for sharing this!! Oh my!!! I don’t even know what else to say except YUM!!! THOSE LOOK AMAZING! Keep up the good work! We are your newest followers. Thank you so much! I love it when I make something people like! Thanks for coming by and following! I hope you like more of what I do! Thanks Hollie! You have a rare spelling, my sister spells her name the same way! I thought maybe she was actually commenting on my blog (a first). Good to have another Hollie around and I’m glad you like my cupcakes! These look amazing. I am totally sold on this frosting and can’t wait to try it!!! Thank you. Sharing on my FB page. reply as my mouth is watering. These look SOOooo yummy! no, not in any way shape or form. ice cream topping would is WAY to runny and would never set up. 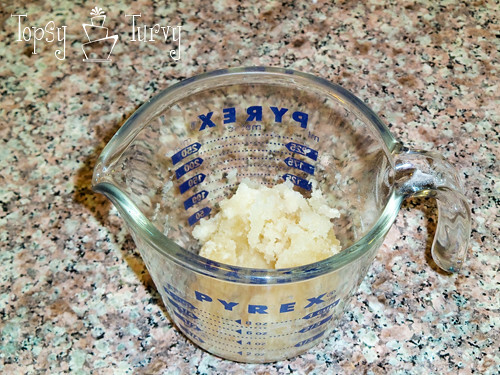 You could melt some kraft caramels and add some cream, or sweetened condensed milk if it’s a bit too thick, but remember a little liquid goes a LONG way, so just a tad bit at a time. Also Gygi.com has a great online ordering and shipping so you CAN get the Peters Caramel! use the discount code topsyturvy for 10% off! Hi I LOVE your blog! Truly an artist ! I was wondering about your marshmallow frosting recipe .. Can it be made in advance and rewhipped when you want to use it? I live in Singapore .. It’s really warm here and does this frosting melt easily ? 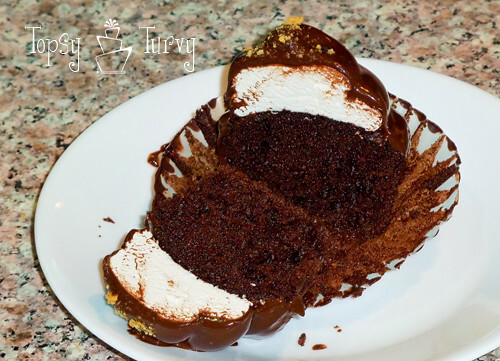 no you can’t make it before, this is actually a basic marshmallow recipe, so it will set, you need to work fast, it will set on your cupcakes OR set in the bag, or in the bowl, once it sets that’s it. it doesn’t melt, it’s a big wad of marshmallow!! !